It’s Nagato Yuki like you’ve never seen her before! Those who know me know that I’ve got a soft spot for the infamous SOS Brigade, Crispin Freeman’s amusing voice-overs as the perceptive Kyon, and the lively, energetic Haruhi Suzumiya, who, to this day, still remains as one of my all-time favorite anime characters. Having sat through the entire series of The Melancholy of Haruhi Suzumiya — including the testing Endless Eight story arc — and the movie, The Disappearance of Haruhi Suzumiya (2010), I’ve been waiting, ever so patiently, for another chapter of the Suzumiya saga to make its way to the small screen. Admittedly, I wasn’t overly excited for The Disappearance of Nagato Yuki-chan — also known as The Vanishing of Nagato Yuki-chan — when it was first announced, chiefly because the manga, written and illustrated by Puyo, was a spin-off the material and not a direct continuation, taking place in an alternate reality to the one Nagato created in the Haruhi Suzumiya anime, with everyone finding themselves living (slightly) altered lives. Furthermore, the series was to be less focused on the zany antics of Haruhi and her troupe, with more of a spotlight on Yuki Nagato, her shy, bookish character, probably my least favorite member of the SOS Brigade. Thankfully, it turns out that my nonchalance towards this revamp was totally unwarranted, as this one turned out to be quite a doozy! This time, Yuki Nagato isn’t an alien. She’s a timid, withdrawn student who spends most of her time immersed in hand-held video games in North High School’s Literary Club, which she runs with her motherly best friend Ryoko Asakura (who’s no longer a psychotic killer). To save her club from complete disbandment, Yuki recruits the sarcastic Kyon — a boy in her class whom she has a crush on — in order to boost its members, eventually attracting the attention of soft-spoken classmate Mikuru Asahina and her best pal, the hyperactive Tsuruya, who pop in from time to time to get involved in the activities. The Literary Club, however, doesn’t really get going until two students from Kouyouen Academy (a nearby prep school) sign up, the bouncy Haruhi Suzumiya (who still believes in aliens, time travelers, and espers) and her loyal devotee Itsuki, the former basically taking over the reins by planning a wild range of shenanigans for the seven members to partake in. With sly and, um, brazen encouragement from their friends, Yuki and Kyon also begin to get closer, the pair almost becoming a couple. That’s until a traumatic accident has a startling effect on Yuki, with those around her uncertain of how to deal with her dramatic change of character. 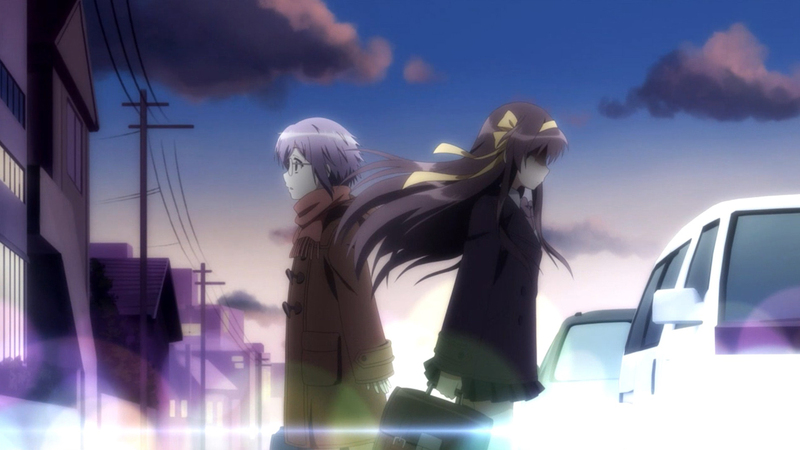 Essentially mirroring events from Nagaru Tanigawa’s Haruhi Suzumiya light novels, The Disappearance of Nagato Yuki-chan works primarily on nostalgia, the series exploring how things might have played out had former protagonist Kyon not been surrounded by omnipotent supernatural beings, the show a fun rom-com that pays homage to its source without ever alienating newcomers. 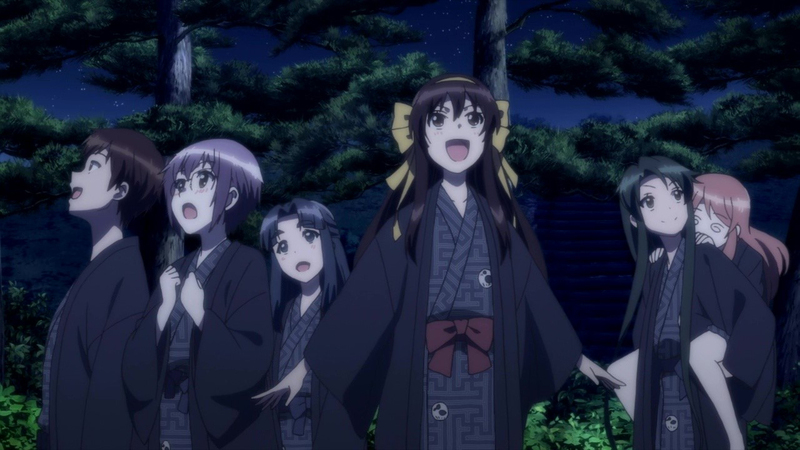 The Disappearance of Nagato Yuki-chan sees the gang celebrate Christmas at the Literature Club — with Haruhi attempting to capture Santa Claus — make chocolate for Valentine’s Day and even take a trip to the hot springs, which includes a matchmaking bath, all of this before Yuki has a near-miss with a car and begins to exhibit a different personality, these ‘disappearing’ episodes alluding to the anime’s title (quite late in the game, too). This brings me to the show’s biggest setback. While I understand that Yuki, the moe god-like entity from The Melancholy of Haruhi Suzumiya, has gained something of a following — with some even shipping her as Kyon’s ideal partner (as opposed to Haruhi) — her character isn’t quite as strong or as appealing as several of the others. Consequentially, the episodes that center solely on the timid Yuki are amongst the series’ weakest, with the central three-episode arc ‘The Disappearance of Nagato Yuki-chan,’ more of a hurdle than a highlight, seeing as it’s missing the sheer vivacity of Haruhi Suzumiya. What’s more, with the series shifting away from Kyon’s sharp headspace, his snarky voice-over is sorely missed, especially given that Yuki is nowhere near as compelling. In any case, it’s delightful to see the entire gang back together again, some having changed while others remaining more or less the same. Kyon is still Kyon, albeit a bit more subdued this time around, whilst Mikuru Asahina has been demoted to a simple ‘moe blob,’ her character serving little purpose, narratively. On the other hand, Ryoko Asakura (who, much like Yuki, was a data organism in the original series) has been given an extended part, the nurturing Ryoko helping our heroine to become more assertive, while the sharp-toothed Tsuruya returns as Mikuru’s well-off best friend. 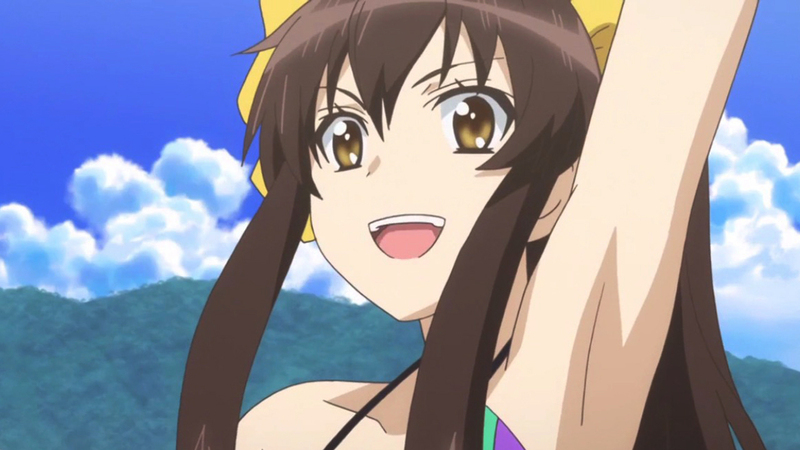 Surprisingly, Haruhi Suzumiya has been given a lot more depth and personality, too, with her pensive side coming to light — this brought about by Kyon, whom she met as a kid some time ago — the eccentric adventurer exhibiting the ability to form honest friendships with others, even if she still retains her dominant characteristics. Last but not least is Itsuki Koizumi, who serves as the main source of comic relief, the guy basically following Haruhi around like a bad smell, obeying her every command, whilst often flirting with Kyon, viewers never quite certain of his sexual orientation. Directed by Jun’ichi Wada, with series composition by Touko Machida, Lucky Star (2007), animation house Satelight, Log Horizon (2013), has made a conscience effort to replicate the former series in every possible way, from its backgrounds and colour palette, to its jingles and faithful character designs, it’s all pretty spot on, with lead Yuki having the only noticeable alterations. Additionally, all of the original voice actors have returned to reprise their roles for both the Japanese and English dubs, The Disappearance of Nagato Yuki-chan working as a solid counterpart and tribute to Haruhi’s beloved escapades. … that feeling of déjà vu. 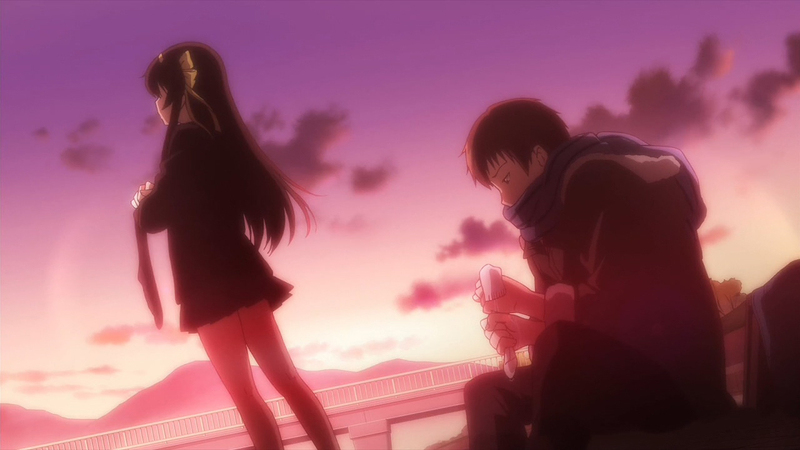 At the end of the day, I honestly believe that no self-respecting Haruhi fan should miss The Disappearance of Nagato Yuki-chan, chiefly the latter part of the show and the excellent OVA titled ‘Endless Summer Vacation,’ which spoofs the well-known Endless Eight arc, the entire series a love letter to one of the biggest anime sensations of the noughties. From cicada catching to the late-night test of courage, there’s so much (retreaded) fun on offer, I almost forgot to finish my homework … again!